So Frances Hardinge has the coolest style, especially when it comes to hats and gorgeous long coats. I was at the Fantasy WorldCon in Brighton last year when I met her. The convention happened to take place over the Halloween weekend, and Frances was laughing when she turned up one evening, because someone on the street had congratulated her on her Halloween costume. When she wasn't actually wearing one. Hmm. I don't know; I think there's some kind of sorcery on the simmer here. 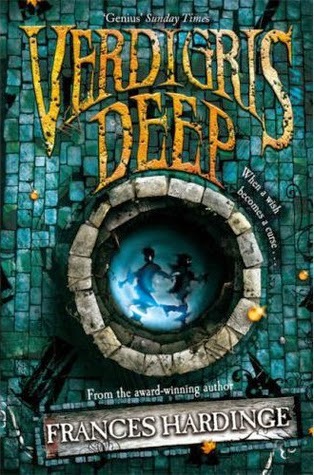 Verdigris Deep was her second novel, and I picked it almost at random from her Amazon page because I was intrigued by the blurb: One evening, Ryan and his friends steal some coins from a well... Then the well witch appears, with her fountains for eyes and gargled demands. From now on the children must serve her – and the wishes rotting at the bottom of her well. If you think it sounds as much like horror as fantasy, you'd be right, and yet there are moments of sinister comedy. Who'd have thought shopping trolleys could be sentient creatures of dread and terror? I was completely convinced, and I'll never pass the Tesco trolley stacks again without looking at them askance and wondering if they're watching me. The witch at the bottom of the well is herself an extraordinary creation, seen initially in Ryan's visions after the three children steal her coins to pay for bus fare. She is introduced stealthily but horrifically: via Ryan's reflection in his own bathroom mirror, or in the eyes of a smiling model on an advertising hoarding. When the witch's true nature is at last revealed, there's something tragic about it despite the horror. She's doing what she was always meant to do, after all; but three twenty-first century children can't possibly have known just how deep a simple wish can go. Ryan is the terrified, ultimately brave young hero, but his friends Josh and Chelle are if anything even more complex and engaging. All of them go through more changes than the reader expects, and they do so through challenges that are far deeper, darker and more twisted than they (or the reader) could foresee. Their happy expectations of being wish-granting Angels are gradually destroyed by the true natures of the wishes and the people who make them – and, of course, their own. Their peril lies as much within themselves as in the supernatural forces around them. It's a dark, intricate tale of fantastical but convincing danger, and it's written with stylish beauty, too. It's mysterious magic, is what it is. Sounds great. I've loved her others but not read this one, will have to seek it out. Oh, and I agree about the hats!